Some people say you shouldn't eat any kind of snacks while you watch TV. But I don't think snacking while watching the tube is a bad thing, just don't turn into a mindless munching zombie. In fact, I think healthy snacking is a good way to get a few more nutrients into your day as long as you pick the right things to eat. A plate full of fresh veggies makes such a healthy snack because you get a nice satisfying crunch and tons of nutrition. 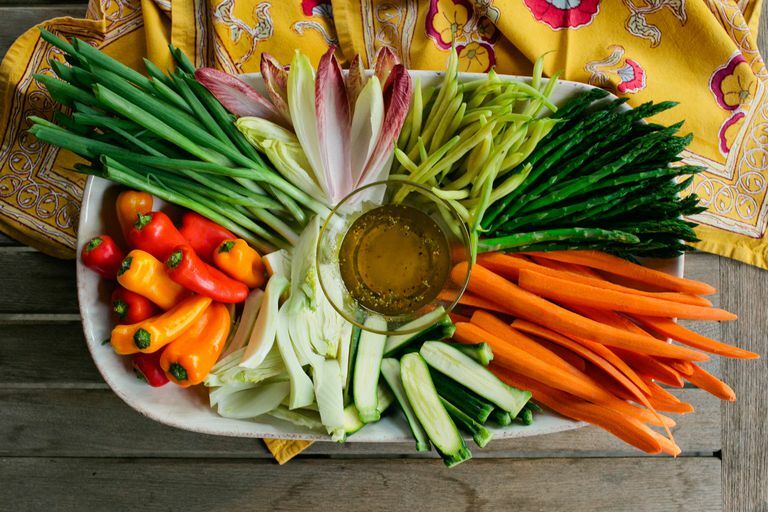 Raw veggies are perfectly fine on they're own, but If you like a little extra flavor, add a little veggie dip, hummus, or salad dressing. Carrot sticks, celery stalks, broccoli florets, baby tomatoes, and chunks of cauliflower are all good choices for a fresh veggie tray. Or dare to be different and try raw green beans and asparagus spears with your favorite lite chip dip. Popcorn is actually a healthy snack because it's high in fiber and it's not high in calories if you don't add tons of oil or butter. If you eat a lot of popcorn, it's worth investing in an air popper. If you like a little salt, use some butter or olive oil spray — just enough so your salt sticks to the kernels. Add one-half cup popcorn kernels and one teaspoon of vegetable oil to a small bowl. Mix them together until the kernels are coated. Pour the popcorn and oil mixture into a brown lunch bag and add a few shakes of salt (no more than half a teaspoon). Fold the top of the bag twice and put it in the microwave. Cook for 2 1/2 to 3 minutes until the popping slows down to one pop every 2 seconds. Open the bag - but be careful of the hot steam. Nuts and seeds are good for your heart because they contain monounsaturated fats. They're also delicious and maybe a little bit addicting. Nuts and seeds are high in calories, so if you need to watch your weight, you'll also need to watch your portion size. Pour a small serving in a dish — don't take the whole can of nuts into the living room. Nuts and seeds taste best with something sweet so toss a handful of almonds, walnuts, sunflower seeds, pumpkin seeds, and pecans (or basically whatever you have on hand) and mix them with another handful of raisins, craisins, or dried apricots. Makes about two servings. Fruits are good for you because they've got vitamins, minerals, and fiber. If you need your sweetness fix, grab an apple, pear, peach, orange, banana, or nectarine. Cut an apple into pieces and add them to a bowl. Drizzle caramel syrup over the apple (not too much) and add a few chopped almonds. Pour some berries over nonfat Greek yogurt and top with chopped pecans. Slice a banana and top it with a little chocolate syrup. Serve fresh pineapple slices with a drizzle of chocolate and coconut syrups. If you love your snack chips (and who doesn't? ), opt for baked chips rather than greasy fried chips. Serve your healthier chips with fresh salsa, or homemade guacamole. Prefer crackers? Top whole grain crackers with slices of cheese or peanut butter to get that perfect combination of fiber from the whole grains and a bit of protein. The United States Departments of Agriculture and Health and Human Services. "Dietary Guidelines for Americans 2015-2020." http://health.gov/dietaryguidelines/2015/guidelines/.